Jonathan Pollard's attorney says that Pollard wants to start a new life in Israel, and was very moved by recent video of students singing. When it comes to the full release and rights of Pollard, one man in Jerusalem is more in the know then most. Larry Dub has served as Jonathan Pollard’s chief counsel for over 20 years and is still serving as one of his attorneys in Israel. 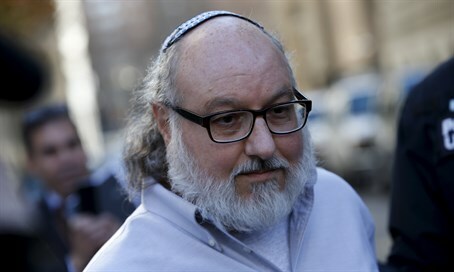 He spoke to Arutz Sheva about Pollard’s parole restrictions and what is being done to get them revoked. Dub is one of three top level lawyers who are representing Pollard. He is the head of Pollard’s defense in Israel. Attorneys Elliot Lauer and Jacques Simmelman represent Pollard in the US. “There are different needs here and there are different needs in the States,” said Dub. Currently the defense team, along with the rest of the Jewish nation that has been backing Pollard, is waiting to see what the results will be of the suit. When asked about what people in Israel can do to help, Dub responded by saying that: “right now the focus is on the court case in New York and the hope is that we will see positive results shortly. But what can be done is to send letters of encouragement to Jonathan, who along with Esther, have received many letters that have helped them. Letters can be sent to letters4pollrd@gmail.com. Jonathan was also very moved by the recent video put online by the Ulpana in Petach Tikva on his behalf. He has seen it many times and is very appreciative. Larry Dub graduated with a Doctor of Law degree from Cardozo Law School of Yeshiva University in 1979. In 1995 he was retained as chief counsel for agent Jonathan J. Pollard, and continues to represent him till this day. He runs Larry Dub & Co. a full service Israeli-American law firm located in Jerusalem, Israel, with associated offices in Haifa, New York, and Rhode Island. He is the founder and senior attorney for the firm.